been reading about socializing the puppy by taking it out to meet other dogs and people. my question is, when can you start really taking a puppy out for walks? coz i have been advised not to take my chow out until he's about 4 months. mine already has his rounds of 5in1 and 8in1 vaccines at 3 months and will be getting his rabbis shot probably this weekend per his vet's advice. i've been taking out kuma for short walks at night just to tire him a bit and to get him used to the leash but i want to take him out for longer walks because big boy has so much energy sometimes and i feel like he needs to let it out through exercise. 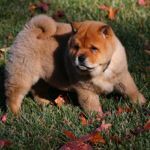 other than walking, what kind of 'exercise' do you make your chows do? Both the breeder & vet advised me to avoid letting the pup walk on any ground where there's a chance unvaccinated dogs have been in the previous 6-7 years. So until a week past his 3rd set of shots (before rabies), I'm only letting him in 4 homes/backyards: mine & family members. I have taken him to the local pet store and let the employees hold him while I shop. I've also taken him to puppy play & school (both indoors), where the other pups have been vaccinated. He's getting plenty of socialization with both dogs and people. I just started introducing him to loose leash "walking" for 1-2 min. periods. In order to let him get enough mental & physical exercise, we go through any number of different games & training exercises. Simply exploring the homes & backyards gives him plenty to do. We practice the "come here" cue by 2 or 3 people taking turns calling him in an excited manner. He comes running and we lavish praise & give a treat. That's a really good workout for a pup. He'll play fetch for short bursts, so that's something I can do alone to give him exercise. I hide and call him when I know he's not distracted. He runs around to find me and gets a treat. I tie a squeaky toy on the end of some paracord and he'll chase that around. He also loves to snap at a knot on the other end, almost like a cat playing with string. I cut a door in a large cardboard box & throw treats inside for him to scramble in & out...same with his crate. We play tug with a rope, then practice "leave it". Various treats inside a Kong after meals provide more mental exercise. He'll chase a football being thrown around, then we give him an old one to chew on. He loves to do zoomies through piles of leaves, so we save some in corners of the yards for him to play in. Of course there's bully sticks and other chew toys. I'm sure there are plenty of other things you can think of using stuff you have lying around. Remember that it's not purely physical exercise he needs, the mental exercise is equally important. Puppies have short attention spans, so change it up. If he's tired from running, I give him something more mentally challenging to do. Remove most of the toys from view at any given time. He'll be less apt to become bored with them. My pup sleeps 2-3 hrs. for every 1-2 hrs. he's awake during the day. He's a pretty active little guy, more so than my previous rough-coated Chow. But it's not hard to find enough to tire him out during his waking hours. That said, it'll be good to be able to take him on walks in another 2 weeks. I'm counting the days. It is good to take your puppy to places where there is a lot of activity, such as, parks, school yards, and any local ball games. Also in the same way, expose your new puppy to other dogs of all ages. You will control these new situations by always having the puppy on a LEAD. Different environments and situations show the puppy that the world is a much bigger place than home. All of this is usually well accepted by a puppy. He is young and curious and will most likely thoroughly enjoy all these new adventures.